A powerful natural blood builder, detoxifier, and allergy-relief supplement for horses. Nutritious raw blue-green microalgae to maintain the body's immune, circulatory, and detoxifying systems. Great support for normal, healthy allergy response. Please enter Qty 1 for each SET of Buy 2 get 1 Free. Spirulina is a deceptively simple supplement containing complex and powerful live enzymes and a wide spectrum of other nutrients. By assisting multiple metabolic functions, it helps maintain a brilliant natural bloom. Live enzymes provide superior results compared to lab-made products. Ideal for performance, breeding, or high-stress situations. For use in horses only. Recommended for supporting healthy immune system function and may help with seasonal allergies. Daily Maintenance: Give at least one wafer per 100 lb. body weight (example: give 10 wafers per 1,000 lb. horse). Recommended: For best results, start out with just a few wafers for the first few days and increase gradually to full dosage. Dose may be doubled or tripled for performance, breeding, or high stress situations. Inactive Ingredients: Dextrose and stearic acid. Spirulina is used in Spirulina Wafers for Horses, Longevity for Dogs, and Spirulina Tablets for People. Hirahashi T et al. Activation of the human innate immune system by Spirulina: augmentation of interferon production and NK cytoxity by oral administration of hot water extract of Spirulina platensis. Int Immunopharmacol 2002;2:423-34. Dasgupta T et al. Chemomodulation of carcinogen metabolising enzymes, antioxidant profiles and skin and forestomach papillomagenesis by Spirulina platensis. Mol Cell Biochem 2001;226:27-38. Zhang HQ et al. Chemo- and radio-protective effects of polysaccharide of Spirulina platensis on hemopoietic system of mice and dogs. Acta Pharmacol Sin 2001;22:1121-4. Jensen GS, Ginsberg DI, Drapeau C. Blue-green algae as an immuno-enhancer and biomodulator. J Amer Nutraceut Assoc 2001; 3(4):24-30. Mani UV, Desai S, Iyer U. Studies on the long-term effect of spirulina supplementation on serum lipid profile and glycated proteins in NIDDM patients. J Nutraceut 2000;(3):25-32. Romay C, Armesto J, Remirez D, et al. Antioxidant and anti-inflammatory properties of C-phycocyanin from blue-green algae. Inflamm Res 1998;47(1):36-41. Yang, HN, Lee EH, Kim HM. Spirulina platensis inhibits anaphylactic reaction. Life Sci 1997;61(13):1237-1244. Draisci R, et al. Identification of anatoxins in blue-green algae food supplements using liquid chromatographytandem mass spectrometry. Food Addit contam 2001;18:525-31. Premkumar K. et al. Effect of Spirulina fusiformis on cyclopho-phamide and mitomycin-C induced genotoxicity and oxidative stress in mice. Fitoerapi 2001;72:906-11. Annapurna, V. Bioavailability of spirulina carotenes in preschool children. 1991. National Institute of Nutrition, Hyderabad, India. J. Clin. Biochem Nutrition. 10 145-151. Seshadri, CV. Large scale nutritional supplementation with spirulina alga. 1993. All India Coordinated Project on Spirulina. Shri AMM Murugappa Chettier Research Center (MCRC). Kato, T., K. Takemoto. Effects of spirulina on hypercholesterolemia and fatty liver in rats. 1984. Saitama Medical College. Japan Nutr. Foods Assoc. Journal. 37:323. Gorban EM, Orynchak MA, Virstiuk NG, Kuprash LP, Panteleimonov TM, Sharabura LB. [Clinical and experimental study of spirulina efficacy in chronic liver diseases.] lik Sprava. 2000(6):89-83. Hayashi K, Hayashi T, Kojima I. A natural sulfated polysaccharide, calcium spirulan, isolated from Spirulina platensis: in vitro and ex vivo evaluation of anti-herpes simplex virus and anti-human immunodeficiency virus activities. AIDS Res Hum Retroviruses. 1996;12:1463-1471. Kapoor R, Mehtu U. Iron status and growth of rats fed different dietary iron sources. Plan Foods Hum Nutr. 1993;44(1):29-34. Kim HM, Lee EH, Cho HH, Moon YH. Inhibitory effect of mast cell-mediated immediate-type allergic reactions in rats by spirulina. Biochem Pharmacol. 1998;55(7):1071-1076. Torres-Duran PV, Miranda-Zamora R, Paredes-Carbajal MC, Mascher D, Ble-Castillo J, Diaz-Zagoya JC, Juarez Oropeza MA. Studies on the preventative effect of Spirulina maxima on fatty liver development induced by carbon tetrachloride, in the rat. J Ethnopharmacol. 1999;64(2):141-147. 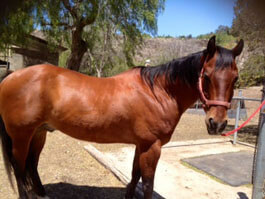 Spirulina Wafers has helped Ace manage a healthy weight. #TransformationTuesday! 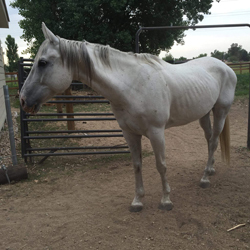 Ace has come a long way now that we have learned to manage his health challenges. The skinny photo is when he was at his worst weight-wise in June 2016. The great photo was taken on Sunday (April 2017). Thank you to all the many knowledgeable friends, veterinarians and supplement companies for helping out Ace, including Springtime for affordable Spirulina Wafers. Also, a huge thanks to Kyle Bray for allowing our funds to be spent saving horses and cats because he loves them just as much as I do. A big relief for Kit Kat & Naomi! 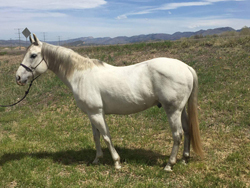 My 28 year-old registered Paint mare, Kit Kat, has had horrible allergies to the midges and gnats here, and scratches all the time. I am very happy with the Spirulina Wafers, as Kit Kat is much relieved, and her skin is not soft and silky. I am placing a second order today – thanks again! 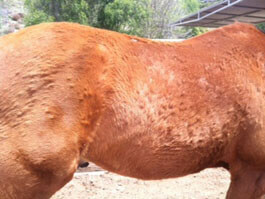 I have a 15 year old Quarter Horse named Clint that was eaten up with hives, and had been experiencing trouble managing his skin health. A year after trying everything and then turning to Spirulina Wafers, the vet was impressed with Clint's gorgeous coat, and the fact that he was so happy and healthy. Travis looking good for 23! Lauren and her Morgan pony. "…decrease in coughing within a month." 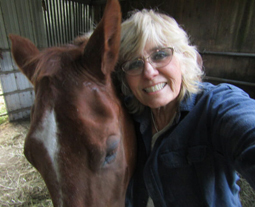 I just wanted to tell you that we have a 23 year old Quarter Horse gelding named Travis. 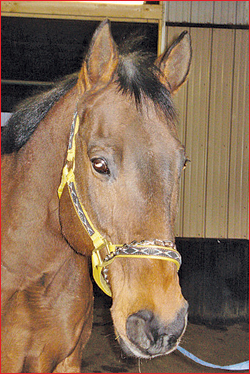 I read about Spirulina Wafers in the Horse Journal and decided to try them to support his respiratory health. We noticed it supported his normal respiratory function within a month. It has been six months on the wafers and he hardly ever has any problems. 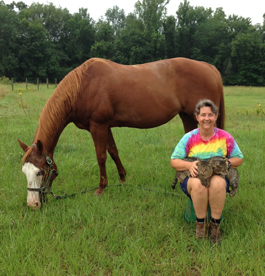 I also have a 22 year old Morgan pony and a 16 year old Thoroughbred. I put them on the Spirulina Wafers also. I am very happy with the results. 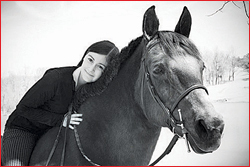 I have attached a photo of my daughter, Lauren Walker, with her Morgan pony. This pony started coughing in the summer of 2009. After trying many things, I decided she was going on the Spirulina Wafers too. So far she is maintaining healthy breathing, and she has been on the Spirulina Wafers for three months. No Hair Loss from Midge Allergy!